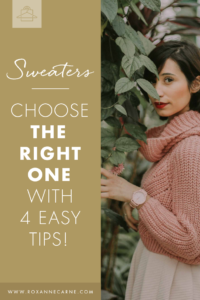 Sweaters – Choose the Right One with 4 Easy Tips! How do you choose the right sweater for your wardrobe? One of my fabulous clients recently asked me this question and I'm happy to share these tips with you too! Now that the winter season has officially begun, you might think that it means drab, bulky clothing, but that really isn’t true! 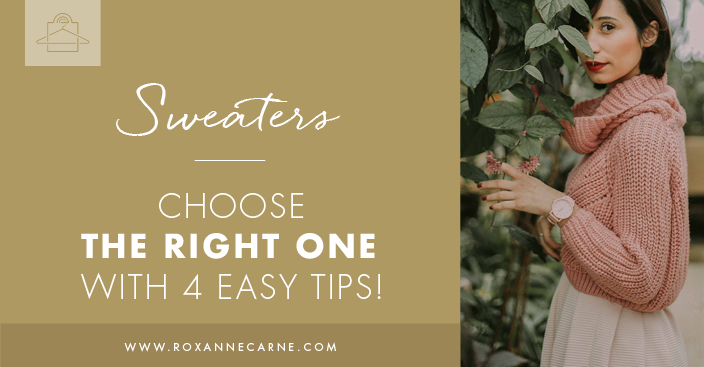 In today's post, you'll discover four easy styling tips to help you rock your winter wardrobe by choosing great sweaters. No ugly Christmas sweaters here! 😉 When shopping for sweaters, I recommend thinking about the entire look that you’re going for first. And then you’ll reverse engineer it from there. For example, let’s say that you decide to wear tall boots with a skirt that hits right above the knee. If you want a layered look, you could pair this with a lightweight long-sleeved cashmere sweater along with a blazer and scarf to drape over your shoulders. Or you could opt for a longer, heavier knit sweater that hits above the knee (slightly above the skirt). Then you can top it off with a wide stylish belt to add some balance and interest. See how easy that was? Overall, you’ll want to consider the neckline, length, volume, and texture as these each have a significant impact on your look and functionality! As with any top, you have lots of options when it comes to the neckline (remember this blog post?). Carefully think about the neckline and how it looks on YOU. For warmth, turtleneck sweaters are always a great option (here are some tips on how to style your turtleneck), but this season I’m seeing the funnel neck sweater as a stylish alternative. A funnel neck is kind of like a mock turtleneck, except that the fabric is more loose fitting around the neck area. I love the modern look of a funnel neck top and it’s so comfortable too! You also have more neckline options such as the V-neck, boat neck, crew neck, off-the-shoulder, etc. The list goes on and on! A sweater’s length also plays an important factor when styling your look. Do you want to go with a trendy cropped sweater that you can layer on top of colored tank or turtleneck? Or will you opt for a sweater dress for those colder days? Or go for a traditional one that rests at waist-length? Think about the bottoms you’ll be balancing the sweater with and decide from there. Depending on the style you're aiming for, a sweater's volume goes a long way. If you’re looking for a relaxed, no-fuss look, then you’ll want one that fits more loosely and gives you room to move. (Warning: be careful here because if you wear sweaters that are too baggy, it may just add a bit too much volume to your frame. Believe me, you will know it when you see it!) On the other hand, if you want a clean, classic, and structured look, fitted sweaters are the way to go! 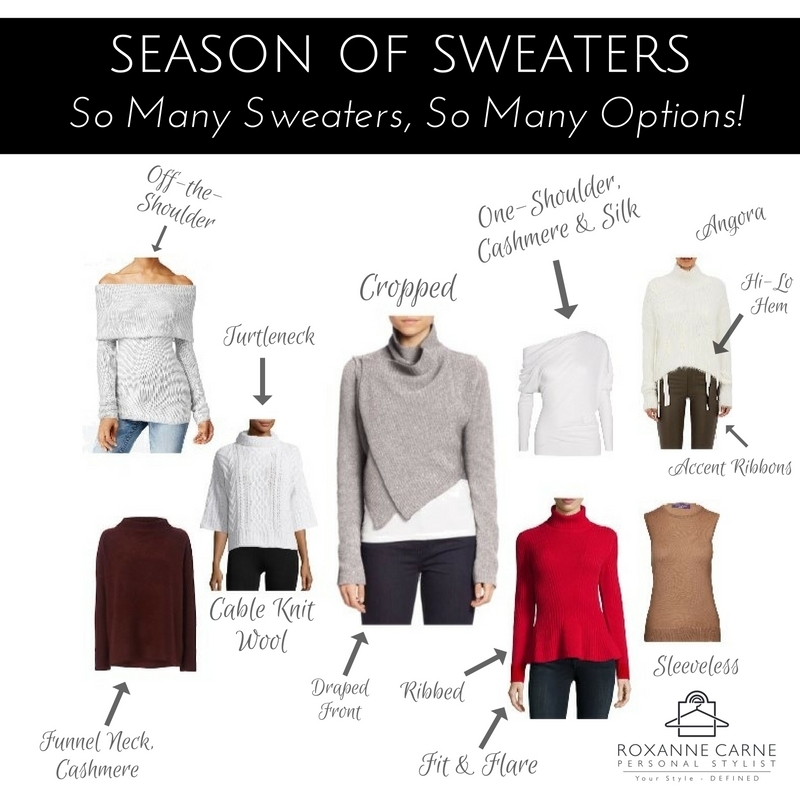 A sweater's fabric and knit gives you a myriad of options to choose from. You've got wool, cashmere, angora, fleece, cable knit, ribbed knit – this list can also go on and on! Remember this: a sweater's fabric and knit tie closely with its volume so keep this in mind as you choose your snuggly top. I hope these tips on how to shop for a sweater are helpful to you. Please share these tips with anyone that you think may need them!